Mera, Queen, and Arthur Curry's former wife, makes my list at #5. Personally, I grew up spending summers- well, all seasons- on the beach and adored Aquaman. 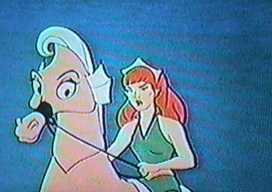 Redheaded queen wife Mera was one of the rare redheads, and she was Aquaman's equal partner. Aquaman gained his own series for the first time with the publication of Aquaman #1 (Jan-Feb 1962). Aquaman had met Mera, a queen from a water-based dimension, and he married her at the same time he was crowned king of Atlantis, Aquaman #18 (Nov-Dec 1964). They soon had a son, Arthur, Jr. (nicknamed "Aquababy") in issue #23 (Sep-Oct 1965). Mera had her own breakdown and struggles after the death of their son, Arthur, Jr. She blamed her husband for his death and left him. Comic Treadmill's Aquaman 16-18 (1964) review . A lot of other great Aquaman reviews on this site. I had been reading the Aquaman series [This series ran from issues #1 (Feb 2003) to #39 (Apr 2006)], and the new series renamed Aquaman: Sword of Atlantis with issue #40 (May 2006), written by Busiak and illustrated by Butch Guice, gives Mera a starring role, and has lead to some gorgeous Mera artwork. Alex Ross in the Justice series has luscious Aquaman and Mera panels also. also, when aquaman married mera, it was the first time a superhero had an on-panel wedding in his own comic (the dibnys were married, but ralph was just flash's pal back then). 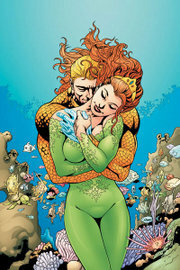 sure, reed and sue got more attention when they got hitched a year later, but aquaman and mera were way ahead of them. they were the first to have a kid, too. If I don't see a string of pearls and a white dress tomorrow, I'm gonna be very angry. You won't like me when I'm angry. Yikes! I'm going to be in NYC for the next few days and I won't be able to check the final results until I return. The high ranking of Mera is fantastic. Three spots left. Barbara Gordon and Mike Murdock will surely take two of them. Who will the third red-head be? Thanks buttler, good points about the aquamarriage.